Stained glass has a long history dating back to Egyptian and Roman times, but has developed a great deal in the last thousand years. The medium reached its peak in the Middle Ages as Gothic architecture, used for Cathedrals and churches, placed an emphasis on interior light in religious buildings. Stained glass windows gave the opportunity to portray Bible stories to a population that was largely illiterate. It evolved as an art form as the development of new techniques made production cheaper, and was more commonly seen in homes when the use of stronger building materials allowed for larger windows at a lower cost. Over the last century, stained glass has fluctuated in popularity, but can still be seen in many homes, with the intention of portraying grandeur and status. Solomon and Hirst are both currently active artists, working in a world where the Christian church’s power has declined. This is evident from the 2011 UK census; while Christianity still held a majority of 59%, an increasing number of people responded as having “no religion”. Despite this, stained glass maintains its symbolic link to the Church, and it is often here that young people first encounter quality examples of the medium. It was used by the Arts and Crafts Movement and Art Nouveau in the late 19th and early 20th centuries, becoming more fashionable and bringing with it a new way to create decorative, abstract designs. One of a series, “Mighty Healthy” (2016) is a basketball backboard hand-crafted by Solomon out of stained glass, in traditional Tiffany style taught to him during a year-long apprenticeship, with a net made from Swarovski crystal. Mimicking both a window and a backboard, the bold lead lines stand out against the clean background of the gallery and the opalescent glass obscures the wall behind it, creating a softer effect than normal stained glass. The artist has chosen to show the piece on a wall rather than as a free-standing or suspended object, drawing a greater parallel with a stained glass window. With a number hung around the gallery, the space begins to feel like a church, each piece lit by spotlights as if they were holy icons. Solomon is exploring the rise of the celebrity of sport, and the passion of the audience that adore sports and its personalities. Even the terminology has crossed borders; the word “fan” or “fanatic” derive from the Latin word “fanaticus” meaning ‘of a temple, inspired by a god’, from “fanum” meaning ‘temple’, and was first used as a noun to describe religious zealots. This isn’t really surprising, considering the ferocious loyalty of some sports fans. The name “Mighty Healthy” is taken from a song by Ghostface Killah, a member of the Wu-Tang Clan. Both hip-hop and basketball were highly influential in America, and are heavily linked, with many of the stars on both sides growing up in the same areas and dealing with similar issues. Some of the stars have moved between careers, including Shaquille O’Neal, whose playing career spanned nearly 20 years and who has also released four rap albums to date. The Tiffany style, used by Solomon, was pioneered in 1880 by Louis Comfort Tiffany, and is characterised by the use of opalescent glass which can be seen in “Mighty Healthy”. This method became very fashionable, especially in America, as it complemented the increasing use of marble and limestone in architecture; there was a Tiffany window in the White House until 1904. Solomon has combined these three icons to create a narrative of the modern American Dream. While the pattern may be abstract, the form carries its own narrative; the rise in the status of sport, and its ambassadors celebrated to the point of becoming household names. From the materials chosen, it’s clear that this backboard is meant to be looked at, not used. Extensive time and effort has gone into making this item unique, and this could not be further from its playground counterpart. Many people, young and old, continue to harbour dreams of achieving fame through sport. The success stories can be seen everywhere, often including unlikely candidates, and all seem to follow the same pattern – if you work hard, you can achieve it. A simple message, and very effective branding. Solomon has chosen to use mirrored glass in this design (and others), and as the audience admire the work they also view their own reflection. He toys with the themes of ambition and vanity, placing the viewer in the piece so that the achievement of a grandeur becomes tantalisingly close. Solomon himself has described this series as being about “the fragility of luxury”. If this backboard were to be used, it could easily become badly damaged. It has no use beyond decoration. When the utility of an object is stripped away, owning it becomes an expression of luxury and excess, a reward of perseverance and ambition. Hirst’s piece, “Doorways to the Kingdom of Heaven” (2007), explores the idea of excess but in a different way, incorporating his well-loved theme of death. These giant imitation stained glass windows are covered in butterfly wings, taken from real butterflies. These insects have become a regular motif in Hirst’s work, and he uses them (and other insects) to explore mortality, construct life-cycles, and pick apart their beauty under harsh lighting. In “Doorways…”, the window designs are symmetrical and each of the wings is chosen to perfectly match its reflections. The obsessive collecting and the level of organisation in this piece brings to mind Renfield’s obsession with death in Dracula. Renfield believed that he could stave off death by consuming as many lives as possible. He begins by compulsively collecting flies, and slowly increases the size of his “meals”, much like the tale of the old woman who swallowed a fly, in an attempt to consume these in a more efficient way. Rather than consuming the insects to seek immortality, Hirst has immortalised himself by creating artwork with them. The triptych is enormous; an explosion of primary colour, the black background imitating the lead lining of a stained glass window and emphasising the brightness of the hues. The piece is overwhelming, the scale creating a magnitude worthy of its title; “Doorways to the Kingdom of Heaven” references the religious connotations of stained glass windows, and conjures up images of pearly gates. Cathedrals and other holy buildings use scale to impress upon visitors a sense of humility in the face of such grandeur. Earlier this year I visited Liverpool Anglican Cathedral, and the elaborate interior, amazing scale, and the use of light and sound created an atmosphere of warmth and safety, all the while impressing on the visitors their own insignificance. The gallery light may be harsher, the walls may be bare, but the huge arched doorways offer a experience. Hirst invites the audience to step closer and explore the world he has created with open-mouthed wonder. The viewer is drawn in by the scale, and kept there by the detail. Teetering on the edge of mania, Hirst’s work explores an idea that became popular in Gothic literature in the 19th Century; man playing God. At the time, science – medicine in particular – was progressing in leaps and bounds, and people began to fear that man’s power over nature would have negative consequences. These fears are well documented in Frankenstein, as the title character experiments with overthrowing death without considering the aftermath. He mistakenly believed that he would be in control of any outcome. Hirst references this self-assurance in the title of the piece; as the creator of the work, he intimates that he has the power over admissions into Heaven. By placing a collection of perfect samples before us, Hirst explores the increasing power of science over religion, and mankind’s effect on the world around us. As with much of Hirst’s work, he places emphasis on science, and the format of this triptych is reminiscent of an entomological collection. The work is stunning, as nature often is, but examining the beauty in detail simulates scientific scrutiny. From afar, the colours and patterns of Hirst’s “kaleidoscope painting” offer a sense of order and wonder, but up close the truth of the piece is laid bare; as beautiful as the piece may seem, its real subject is death. There is no pretending that the butterflies may still be alive, for they have been separated from their bodies. In laying this starkly before the audience, Hirst jilts them out of their promised route to the afterlife. Both Solomon and Hirst harness the power of these religious motifs to lay a future before the viewer. Solomon captures the ambition of the audience and offers them a life of luxury that most can only dream about. Hirst invites the viewer to examine the entrance he has constructed, exposing them to repeated reminders of their own mortality. People have always sought answers and solace, increasingly without religion, focusing their lives on their passions with the knowledge that the world is a fragile and finite place, and this is what makes it beautiful. Morris, E. (2000) “Stained and Decorative Glass”. Bounty Books. My love of horror began when I was eleven years old and I started reading Point Horror books. Since then I worked my way through piles of Goosebumps, The Blair Witch series, and anything by Stephen King. Then came the horror films, once I was old enough – exorcism films are of particular interest, but Scream, The Descent, and [REC] have all been favourites. And recently I stumbled across John Kenn Mortensen’s drawings on sticky notes. His subjects are monsters, and the humans around them appear largely unaware. There’s an abundance of teeth, claws and horns, and enough empty gazes to fill a lecture hall. But my favourites are the creatures in the houses, which come weaving out of wardrobes and televisions, leering over the human residents while they sleep or stare at their phones or simply look the other way. Because something creeping into our homes without our knowledge is incredibly unsettling, as anyone who has been burgled will tell you. We create sanctuary for ourselves in these spaces, and when we lose control over who enters it can shatter our sense of safety. I like the hints of monsters – the footprints of “Toby” in the first Paranormal Activity; a shadow passing in the background; cupboards flung open; messages carved into surfaces by an invisible creature. All the bits before the monster attacks, when it’s dwelling in the space, detectable but deniable. Inspired by all this, I’ve been making rough designs of monsters with the view of trying out more model-making, using images cut from furniture catalogues as a starting point. The beauty of these is that the pictures are versatile, particularly the ones that include people. The subjects of these images appear happy and relaxed, as the idea of peace at home will sell more furniture, and most of these images only include one person, as any more than one would be distracting. There’s great potential for making these images unsettling by adding a monster to juxtapose with the peace, with loads of space to do it. And it’s fun, too. Both include golden spheres – Solomon’s is a stack of 30 gilded basketballs, the grip-enhancing texture still visible, while Martin’s is a single ball that has the appearance of an antique. Oh, and Martin’s is a bomb. “100 Years” was set to detonate in – yes, you guessed it – one hundred years, and currently has eighty-eight years to go. When on display, it sits on the floor without a plinth, small and unassuming. The sphere has a diameter of 20cm, and its size and the way it’s displayed make it easily missed. However, once the audience become aware of it, it’s difficult to ignore. Now, it’s important to recognise that the orb may not in fact be a bomb, but this doesn’t dampen the psychological effect of being told that it is. In fact, I think the ambiguity makes it more effective. Without taking it apart and examining it, the audience are unable to ascertain its true nature, giving a Schrödinger’s Cat effect. Solomon’s piece has a similarly ambiguous nature due to the materials used. Basketballs are made to be durable, bouncy, and light, but coating it in gold gives a denser quality, and these ones appear more heavy and breakable. The surface continues to have its tactile quality as the texture has been retained, but its value as an object of play or sport is gone – it is now an ornament. Solomon has effectively rendered it useless, while simultaneously glamorising it. A common theme in Solomon’s work is the celebrity of sport, as he transforms sporting goods into iconic objects by altering the materials. The bright, lustrous gold has connotations of royalty and wealth, and its freshness gives it an essence of youth. In contrast, “100 Years” has been made to look very old from the start. It commands a quiet respect – it doesn’t need to be shiny to get attention because its function does that already. In fact, making it appear older than it is lends authenticity to its apparent nature. While the detonation date is far in the future, it serves as a reminder of the audience’s mortality; the current average life expectancy in the UK is 81.5 years and it is very likely that anyone who has already seen this art piece will be gone before it goes off. Death and the passage of time are common themes that run through Martin’s work, and this piece places a marker at a point in the future that few of us will see. This leads the audience to consider the fate of this piece as well as themselves, and wonder where it will be when the time comes. By giving the piece a lifespan, it anchors itself in the future, and grants the artist a moment of fame beyond his death. A similar effect was created by “Back to the Future Part 2” – by predicting 2015 in a particular way, it benefited from a resurgence on social media when the present overtook the imagined future. Born in 1972, Kris Martin would have been 19 when the Cold War ended, and grew up during a time when nuclear war was a constant but invisible threat, a theme that resonates in this piece. Additionally, “100 Years” was created three years after the September 11th attacks, and explores the post 9/11 world. Signs warning people to never leave baggage unattended are a common sight in most airports, and suspicious items are encouraged to be reported. In one notable case from September 2010, a cuddly toy horse was detonated by a bomb squad when abandoned outside an elementary school in Florida, just in case. And in the March 2016 suicide bombings in Brussels, an airport and metro station were targeted, and the bombs used were disguised in bags and suitcases. Hiding a bomb inconspicuously is key to it going unnoticed by onlookers. As art comes in many forms, anything could be used to conceal a weapon in the exhibition space, and an environment that is not expected to be a target suddenly becomes dangerous with the inclusion of “100 Years”. Not having a plinth stops it feeling official, as if it has been placed without consent. Suddenly, the art gallery is changed from a safe space to being exposed and dangerous, as the audience become paranoid and more aware of the objects surrounding them. Its power is dormant, and whether or not it is a weapon, it plays with the minds of those that are introduced to it. Solomon’s piece also imitates weaponry. The way the basketballs are stacked is similar to cannonballs, creating a narrative of destruction and power. In Victor Solomon’s 2016 exhibition “Literally Balling”, held at the Joseph Gross Gallery, “Faulhaber Flex” is displayed alongside his stained glass backboards. While the materials have restricted the objects from being used as intended, they are still associated with their former life, and the audience have the potential to recreate this. Unlike in Kris Martin’s piece where the audience are the victims, here the audience are needed to unleash the potential. Sports personalities are commonly recognised as celebrities, and can be paid large amounts in sponsorship and enjoy a rockstar lifestyle. The term “baller” has become synonymous with being rich and successful, particularly when coming from an disadvantaged background. On Urban Dictionary, it is defined as “A thug that has “made it” to the big time. Originally refered[sic] ball players that made it out of the streets to make millions as a pro ball player, but now is used to describe any thug that is living large.” The title of Solomon’s exhibition references this, while also using another word that has fluctuated in and out of slang vocabulary – “literally”. Used in place of “figuratively” to give more emphasis, it gives the title of this exhibition a double meaning. It refers both to the items in the exhibition comprising entirely of basketball equipment, and the extravagant materials used to produce the work. Sports equipment is commonly associated with childhood, seen in school or at recreation grounds. By gilding an object regularly seen in the playground, Solomon simultaneously stirs childhood associations and the desire for riches and fame. The ball has become a “baller”, exuberant and successful but still recognisable as its earlier form. The ball is transformed into a relic, offering fortune to those that master it. Both use gold as a symbol for power, but in different forms; the power of “100 Years” is dormant and threatening, whereas “Faulhaber Flex” illustrates the transformation that can be achieved through sport. But juxtaposition is also a key element in these pieces, as “100 Years” has a humble appearance that heightens its dangerous nature, and “Faulhaber Flex” contrasts utility with extravagance to explore the audience’s perception of this familiar object. I finished “The Sad Bear” in time for Father’s Day, and it’s now hanging in the living room at my parents’ house. I’m really pleased with how it turned out and completing it has motivated me to paint more often. The gestural style in the background is something I want to experiment with further. I have a few projects in mind for the near future, including working with palette/painting knives. I haven’t tried these before, so expect some posts of works-in-progress soon. I’ve been working on another painting for a few years, which I started in University as a personal project to cover up another painting that I had given up on. Inspiration was drawn from a photograph by Jovajna (see below) that used to be on deviantart, and has been painted in acrylics. While this painting has had no deadline, it has always been on the back-burner. It has been dragged out many times over the years, although more than once this has simply been to sit on the easel for a couple of weeks and then be put away again when the space was needed. However, I decided to give it another go recently with the intention of giving it to my Dad – he has always been a fan of it and it’s Father’s Day this coming Sunday. It’s looking better than it has done in a while. This time around, I have adjusted the eyes slightly, built up the layers of fur on the paws and back, and done substantial work on the background. Having used lower quality paints in my student days, the darker areas in the background were much glossier than the bear itself, so it was very satisfying to get rid of these (although it did mean all the edges of the bear had to be repainted). I played around with the colours of the background as well, wanting to imitate sky and grass without having to paint it in too much detail. In true bear style, the first draft was too dark, the second too light, but I think the third is just right. The eyes need to be made a little brighter and given more detail, although I’m trying hard not to overwork them. The claws will be added again, as they have been lost as the background has been changed. The nose needs to be touched up, because despite getting positive reviews it has been the same since the start of the painting and to me it’s obvious that it hasn’t been given as much attention. Aside from a few other small issues, I’m pleased with how it’s coming along. I could probably keep working on it forever, but I think it’s time to find it a good home and start something new. In the late summer of last year I was discussing a commission with a friend of mine. He had previously requested a painting for his new flat, and as his birthday was also around the corner I suggested I give it to him as a house-warming/birthday gift. Fast forward a year and the painting is finally finished. It’s now a house-warming/birthday/house-warming/birthday present as he has since moved again. After a bit of thinking I came with the idea that spawned the painting above. The design was based on The Usual Suspects film poster, and through some research I managed to establish a potential height chart for the chosen antagonists. I made a digital mock-up and then transferred this to the canvas, and then began the painting. Bowser was the first thing I painted (after a layer of purple primer to stop the canvas looking so bare, and the design in pencil) as he was the furthest in the background. I found making the yellows difficult, as if the mix had too much yellow then the paint wouldn’t be opaque, so white had to be included in the colours and then balanced out. However, it worked out well in the end, and I am particularly pleased with his tummy. The creeper was the hardest to paint because I didn’t draw it to the correct scale, and had to adapt the pattern to suit the size I had made it. It’s still recognisable, and as the width of the canvas didn’t allow for the intended size, the width of the creeper was a better compromise than any of the other featured characters. My favourite bits of the painting are G-Man’s face, Ganon’s body armour, and Wolf’s mask. I’m looking forward to gifting it, and starting something new that won’t take me a year (hopefully!). 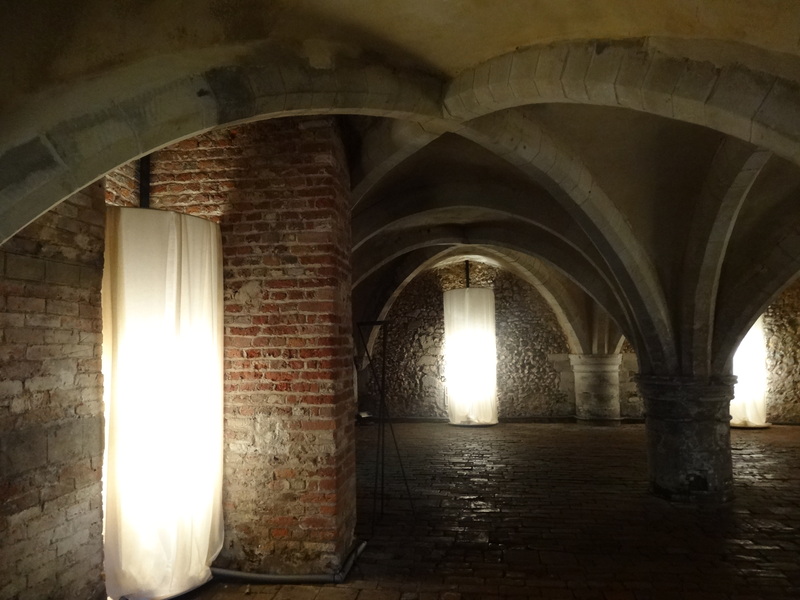 A haunting sound installation based at the Cellarium in Mottisfont Abbey. Drawing inspiration from the morning rituals of monks and the sound of birdsong, each of the backlit curtains plays a repeated musical piece, creating a continually shifting sound landscape.